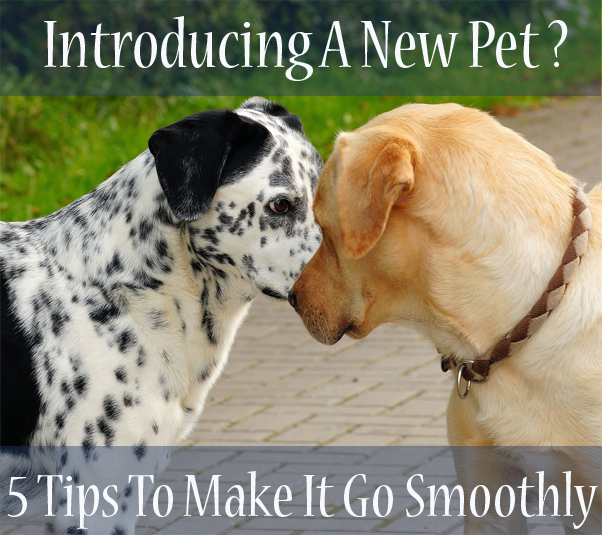 Introducing a new family member to the household can be a stressful occasion but these tips will help make the transition go a little easier…. For the first introduction, both dogs should be on a leach and at a location away from your home, such as a park . This can prevent territorial behaviors. Keep greetings brief at first and maintain a light tone. This will prevent any tensions from escalating. Use the dogs’ body language as a cue…are they tense and alert or do they appear relaxed. If they appear to tolerate each other, it’s a good idea to take them on a walk before going home. Once you are at home, baby gates can help to keep the dogs physically separated but still able to see and smell each other, particularly around meal times. Have separate food/water bowls for each dog. If the dogs do not get along right away, it may take many brief supervised encounters where good behavior is rewarded before they become best friends. What if the new family member is a cat? Have both animals in the same room but keep the dog on leash and allow the cat to leave or have a safe place for he/she to climb up on. It may help to exercise the dog before introducing it to the cat. A tired dog will have less energy and is more likely to be more mellow. If possible, work on a “leave it” command before the cat arrives. If your dog is food motivated, rewarding calm behavior around the cat can also help. ← Can Dogs See In Color?